Who doesn’t like schnitzel? 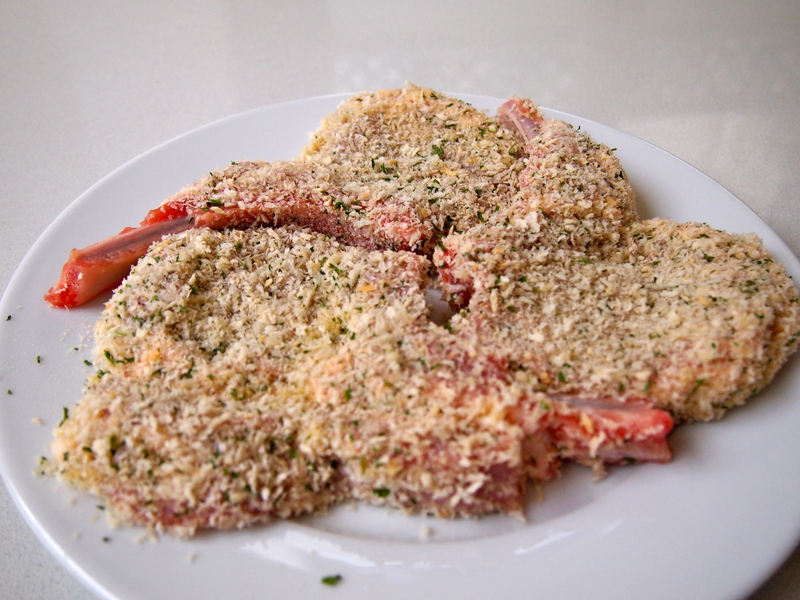 Veal, chicken and even fish all taste great when crumbed. 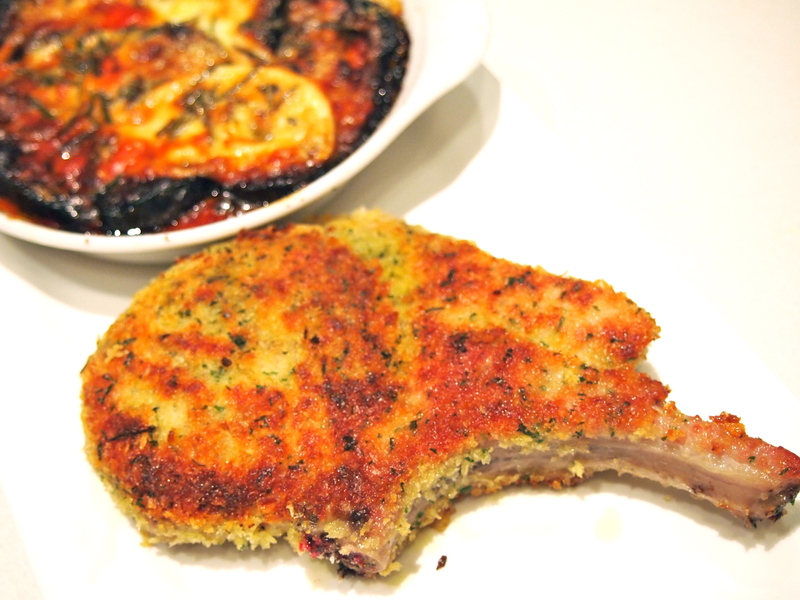 For me nothing beats a good homemade schnitzel and this veal cutlet is just an oversized schnitzel really. I actually prefer the higher ratio of meat to crumb that you get with a thicker cut of meat such as a veal cutlet, this would also work great with pork cutlets. What better accompaniment to a nice piece of veal than eggplant parmigiana. Eggplant would have to be one of my favourite vegetables. 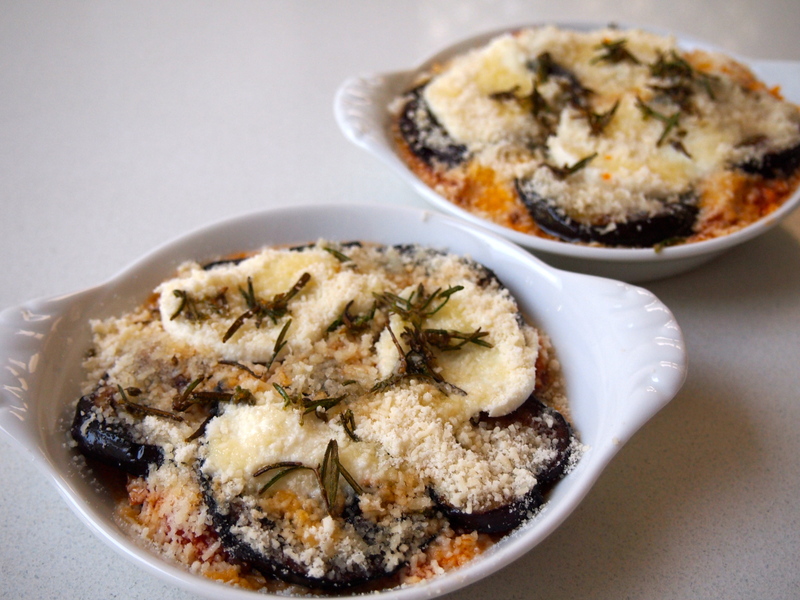 This parmigiana is a pretty quick and easy version – I think with dishes such as this they become more time consuming if you’re feeding a large number of people but for just 2-4 people the amount of eggplant frying is fairly minimal. 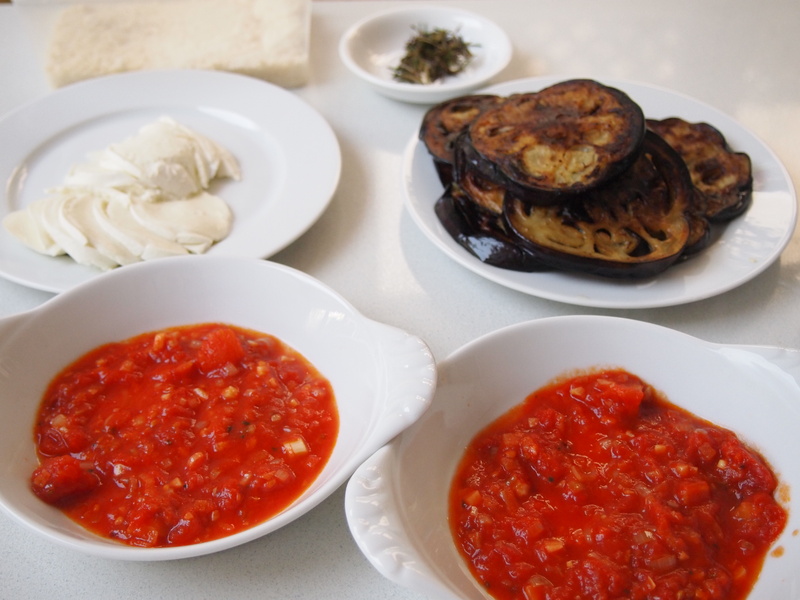 I also don’t crumb the eggplants and just use a very basic homemade tomato sauce and a good quality buffalo mozzarella, I do like to top it though with some crispy fried rosemary sprigs. Season the cutlets with salt and pepper on both sides. In a shallow bowl beat the egg with the milk. Mix the flour and garlic powder on plate and on another plate mix the bread crumbs with the parsley and season well with salt and pepper. 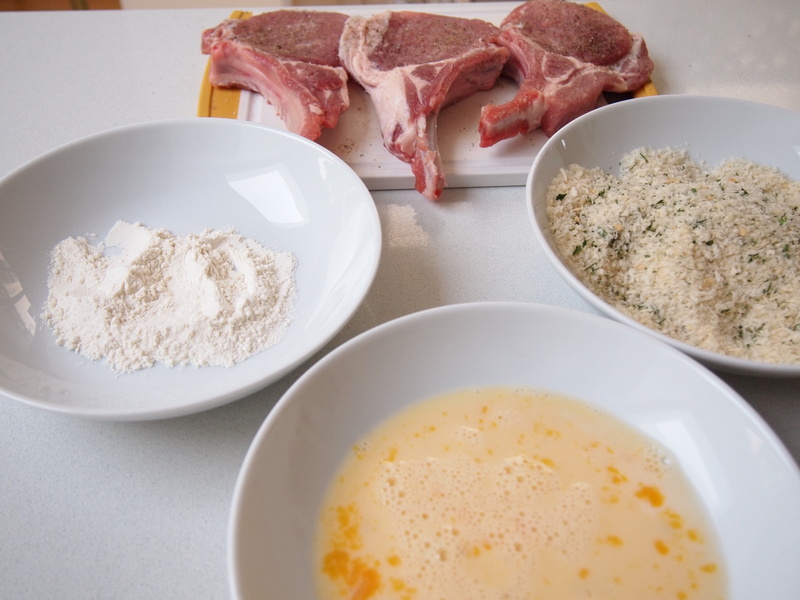 Dip each cutlet into the flour, making sure all the surface areas are coated including the bone. Then dip into the egg, once gain making sure the egg has covered all the flour. Then finally put the cutlet onto the plate with the bread crumbs and press down and turn the cutlet over to get a good even coating of bread crumbs. Repeat with the remaining cutlets, cover and refrigerate until ready to fry. Preheat the oven to 180C. 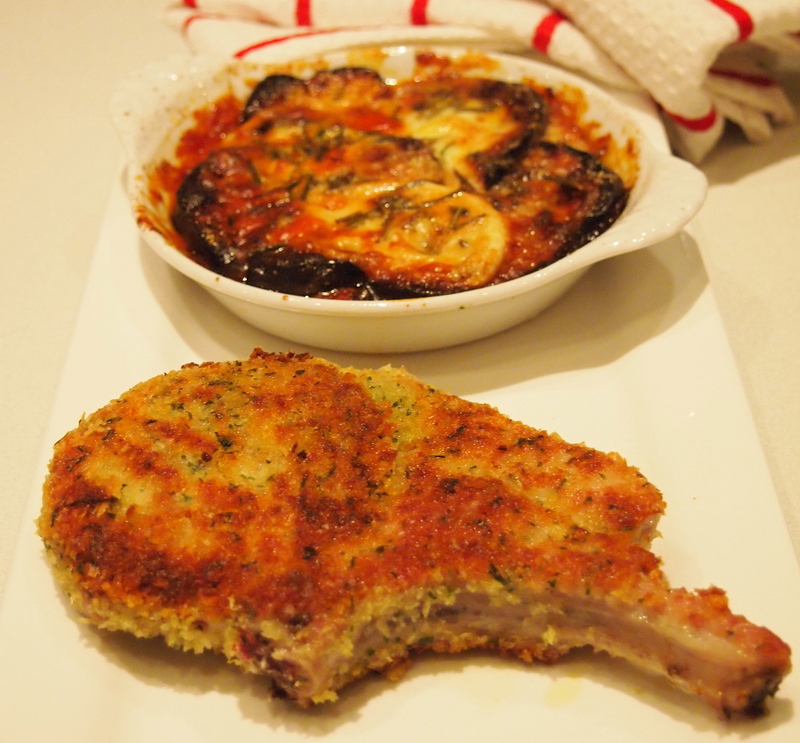 Take the cutlets out of the fridge and let them come to room temperature. Heat a large non stick frypan over medium heat and melt a generous knob of butter with a enough olive oil to give a thin coating to the bottom of the pan. When the butter is bubbling add the veal cutlets, you may need to do this in stages adding more oil if necessary, and cook them for about 3 minutes on each side until golden. Remove and place on a baking tray and transfer to the oven for about 8 minutes. This will ensure that the cutlets are completely cooked through. For the eggplant parmigiana, heat a non stick fry pan over medium high heat and add a generous amount of oil to the pan, at least a quarter of a cup. Eggplants soak up a lot of oil and you’ll need to add even more oil as you fry. When the oil is very hot add the eggplant slices in one layer and cook until golden brown on each side, remove and set aside on a plate lined with kitchen paper and season lightly with some salt. Repeat until all the slices are done. With the oil remaining in the frypan (add a little more if there isn’t any) fry the rosemary leaves for a couple of seconds until covered in oil and slightly crisp. Remove and set aside. To make the tomato sauce heat a little olive oil in a medium saucepan and add the onions. Fry, stirring often until the onions are soft. Add the garlic and chilli flakes and cook for another couple of minutes. Add the tin of tomatoes, salt, pepper, sugar and oregano and bring to a simmer. Put the lid on slightly askew and cook on a low heat for about 20 minutes. Preheat the oven to 180C and place a little tomato sauce on to the bottom of a gratin dish. I used individual dishes but you can use one dish, just make sure it’s not too big. Add a layer of eggplant followed by a little more sauce and then a slice of mozzarella. Repeat the process then top with the parmesan and scatter with the rosemary leaves. Place in the oven and bake for 20-25 minutes. Remove and let it rest for about 5 minutes before serving with the veal.